Several classmates and I have teamed up to start a new forecasting webpage. It is called Riverhawk Weather. The majority of my posts will be over there now but I will still link them here for the time being. I'd be happy if you joined us! We have a facebook group (Riverhawk Weather) and a twitter (@riverhawkwx). Here is this mornings forecast. Another heat wave will begin today for several across Southern New England. If you do not join the 90 degree club today do not worry; you will tomorrow, Friday, and Saturday. With all these heat and humidity one would expect thunderstorms. However there will be no real trigger to fire thunderstorms in Southern New England. Up in Northern New England, specifically the Lakes Region, could certainly see thunderstorms today or tomorrow. Yesterday a sneaky back door cold front screwed up the forecast for NE MA, S NH, and S ME. As my forecasting professor said in college there may not be a weather event more difficult to forecast than a New England BDCF. As I like to lets start with temperatures this morning. Can you see the Back Door Cold Front? Dew Points are generally running above 60, although that is not the case in Essex County, SE NH, and Southern ME. There is a deep trough in the central US and a strong ridge over the Western Atlantic. 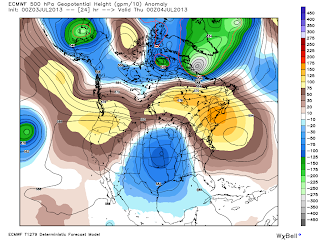 There has been record warmth in the Western US, and record cold in the Central US. 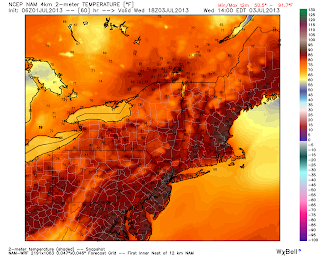 Our record high temps for early July are safe in New England as they were set in the epic Heat Wave of July 1911 that killed hundreds in the Northeast. 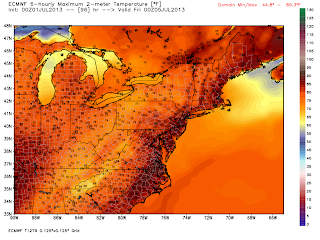 High temperatures will rise to the low 90's near Boston, Providence, Hartford, and Springfield. Most are near 90 with the exception of the Cape and Islands, Northern Worcester County, the Berkshires, and NW CT. With southerly flow around the high pressure in the Atlantic there will be a sea breeze on the CT/RI beaches and Cape/Is. tonight lows will only drop to around 70. Warm, temperatures 88-96. Will fine tune this forecast as there could be thunderstorms Sunday. I think Saturday is another prime summer day. Have a Great 4th everyone! Any downpours that do develop will have plenty of moisture to work with. PWATS are running around 2 inches for Southern New England! 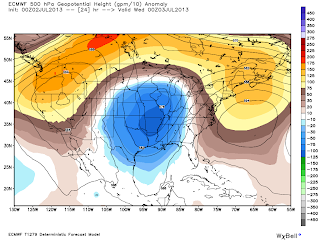 That is the ultimate proof of a tropical air mass. Around 2 PM the bulk of the moisture will be closer to the stalled frontal boundary. It will continue to back towards the Central US. When these tropical downpours develop they do not cool off the atmosphere. One storm forms, rains itself out and it goes back to 75-80 with a dew point of 68-72. At the 500 mb level here is how the pattern will evolve. Tonight at 8 PM a strong ridge in the Western Atlantic is readying itself to send waves of summer back into the Northeast (Heat Wave end of week? 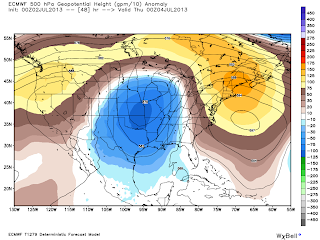 More this afternoon on that) while our trough continues to back west. On Thursday that boundary will more or less fall apart to our west. 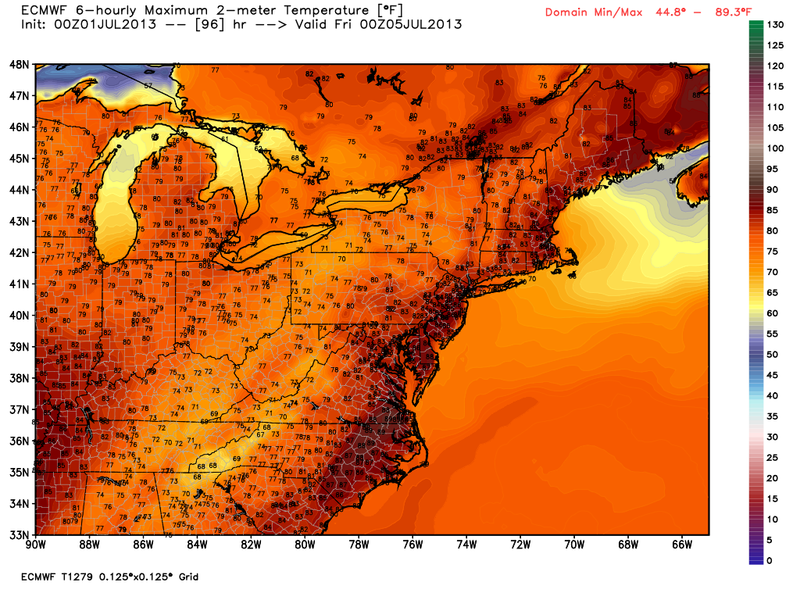 Besides Worcester and the Berkshires (and Cape and Islands) everyone should get to 90 on Thursday. More on the weekend this afternoon have a good one. It has turned out to be quite an active severe weather day in New England. Reports of damage are filtering in every single minute. Soon damage reports from Middlesex and Essex counties will trickle in as multiple cells have been tornado warned. The tornado warnings in NE MA last until 430. We are not looking at big, long tracked tornadoes; as NECN's Danielle Niles pointed out these tropically infused thunderstorms typical produce smaller, short lived tornadoes. No matter as they still cause significant damage if they hit your house. The other threat is the slow moving nature of these storms and the amount of moisture available. A Flash Flood watch remains in effect for the majority of the region. Some warnings are also present. Find info here. 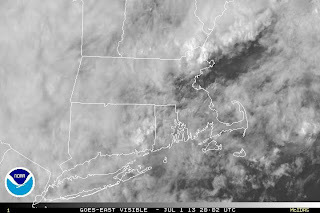 The sun is popping out in Eastern MA as it has been doing all afternoon in Southern Worcester County and Northern Rhode Island. Be smart, don't try to drive through flooded roadways. No need to panic, just be alert of what could happen. 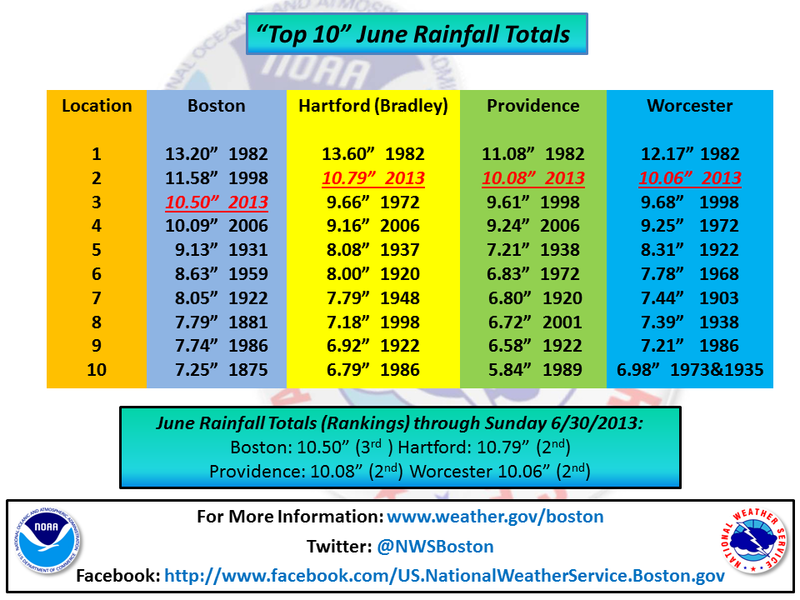 June 2013 is over and into the record books as one of the wettest on record. It seemed like it there was a threat for rain every single day. It appears that the heaviest rains will be located along the stationary boundary. However even if you are not in the Flash Flood Watch any shower that develops will have the potential to drop an inch of rain in a brief period of time. The threat is severe weather is minimal; however dangerous lightning will accompany any thunderstorm that is able to develop. Damaging winds are possible as well. The thunderstorm threat is similar; heavy rain and dangerous lightning but low chance of severe wind, hail, and tornadoes. The NAM hires is indicating a heavy stream of showers/embedded thunder tomorrow morning around 7 am so heads up with the morning commute. North and West of Boston may approach the mid to upper 80's, specifically the Merrimack River Valley. The pattern begins to shift on Wednesday but the threat for showers and storms will continue. Its going to be warm on Wednesday and it has great beach potential. Be prepared for late afternoon thunderstorms all throughout New England. SPC does not have a risk of severe storms yet but I think this will upgrade by Wednesday morning. The main focus for showers and thunderstorms looks to be out by the boundary in the Ohio Valley. While isolated storms will be possible, the overall Thursday-Saturday time frame looks good to go for weather. Friday is similar. Will fine tune the weekend (Thursday-Sun for many) forecast today and tomorrow. Overall looks good. Have a good Monday.